A Simple Trick To Change People – Without Arousing Resentment! Okay…why would we want to change people? Aren’t they good, just the way they are? We’ll, we need to change people at times, for their betterment or either due to something wrong that they do. And it isn’t wrong at all if we want to change people for a good purpose. When we talk about ‘Changing the world,’ we knowingly or unknowingly state our intentions about ‘Changing the people’ too. •And sometimes they end up insulting you and making you feel base. It feels really bad when you take a stand for making something or someone better, and then the price you pay for it is an unexpected outcome containing insult, hatred, and rejection. It took a lot of guts for me to even be able to start a blog. Much because of the reaction of some people around me. I mean that it is really surprising to find out that in what way people may start judging you, even if you try to do a useful and sensible thing. What I wanted to do was just a tiny deed of ‘inspiring’ people. and as I didn’t want to die without expressing a few words of wisdom which I have learned, and which may help my people (The World). Sorry if reading this wasted your time, but this was my personal experience with ‘changing people’. But not everyone is like that. Some people don’t at all resist new changes, and instantly understand what you want to say without taking it the wrong way. And they do it in a cheerful manner which in some way teaches us some new lessons too, with the thorough exchange of knowledge. But yet the reaction of the stubborn people is justified too because, there are a plenty of people who poke their noses into others affairs instead of minding their own business. And they randomly give advice on any topic without having a particular knowledge or information about it. From financial to relationship advice, almost anything. And that is the reason why those stubborn people don’t let you speak because they’re skeptical that you may be the one among them. Generally no one likes to take an advice from a novice. And most people believe that everyone is capable of solving others problems and giving advice, but when it comes to their own problems, they get stuck! Remember this, practice this and no one will be able to shut you up. I thought a lot, and then arrived on this conclusion. • What if a beggar starts giving you financial advice. Funny! And what if Bill Gates does the same? You’re smart enough to understand the difference. • What will happen if a smoker asks another smoker to quit smoking because it is injurious to health. • Will you hear the preaching of a terrorist? So you see that in above mentioned circumstances we come across few situations that make us think about a big reason why we fail in changing people. And do you know about the hidden benefit behind this trick? While you will chase your motive of rightfully changing people, you will end up having become a changed person who will be closer to perfection and a better human being. You’ll be much like role model. And you will find out someday that you have become a person who you once wanted to be. Also because you will have to make others better, you will better yourself. Ask others to do what you do yourself. 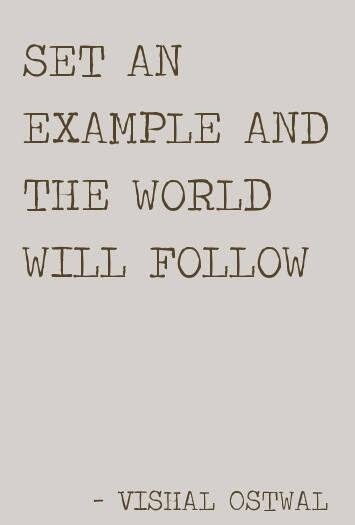 Set an example and the world will follow. Become a role model in something, no matter how small is the difference you make in yourself and others, and inspire people to change with the change within you.